January 30, 2013  President Obama told a friendly audience in Las Vegas Tuesday that the prospects are bright for an overhaul of immigration laws, now that bipartisan congressional leaders are on board. The new sense of urgency comes after Latinos turned out in large numbers last fall to help re-elect the president. January 25, 2013  President Obama named Denis McDonough his fourth chief of staff on Friday, replacing Jack Lew, who has been nominated to be secretary of the Treasury. McDonough, 43, has been deputy national security adviser and a foreign policy advisor to Obama for six years. January 25, 2013  President Obama has tapped a former U.S. attorney to lead the Securities and Exchange Commission. The president says he wants a tough new cop on the financial beat. 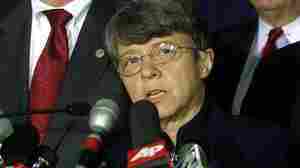 Mary Jo White would be the first former prosecutor to chair the SEC. Can An Ex-Prosecutor Make The SEC Tougher On Wall Street? January 24, 2013  President Obama's choice to head the Securities and Exchange Commission has prosecuted terrorists and mobsters. If she's confirmed, Mary Jo White's next challenge will be tackling reckless behavior on Wall Street. The success of this get-tough push will depend on changing the SEC's culture, analysts say. January 23, 2013  President Obama vowed in this week's inaugural speech to address climate change. The comments recevied a chilly reception in Congress. There are, however, steps the administration can take on its own. January 22, 2013  President Obama invoked both Abraham Lincoln and Martin Luther King as he took the oath to begin his second term. Obama told the crowd a decade of war is ending and the economy is taking off again. January 17, 2013  President Obama begins his second term much the way he ended his first — locked in a fiscal fight with congressional Republicans. But the president's argument that the November election would break the logjam hasn't panned out just yet. January 15, 2013  At a White House news conference Monday, President Obama compared lawmakers who refuse to raise the debt limit to deadbeat diners who gorge themselves at a pricey restaurant, then try to skip out without paying the bill. Congressional Republicans quickly rejected the president's argument. They hope to use the debt ceiling fight to put the government on a spending diet. January 10, 2013  President Obama will nominate his Chief of Staff Jack Lew to be the next Treasury Secretary. Lew is a budget expert who could hit the ground running as the treasury tries to cope with a looming debt ceiling, automatic spending cuts and the ongoing push for long-term deficit reduction. January 8, 2013  Chuck Hagel would be the first Defense secretary to have worn the uniform of an enlisted man, and also the first to have fought in Vietnam. Hagel won two purple hearts, and still carries some of the scars and shrapnel from that war. Obama says that makes him the kind of Pentagon leader that U.S. troops deserve. January 4, 2013  President Obama may go into the next round of fiscal battles without his long-time Treasury Secretary. Tim Geithner reportedly plans to step down in January, even as the Treasury Department is scrambling to avoid cracking the government's debt ceiling. Robert Siegel talks with Scott Horsley about that and other personnel changes as the president prepares for his second term. January 2, 2013  Robert Siegel talks with Scott Horsley about the fine print of the tax deal, which keeps President Obama's promise to raise taxes on people making more than $250,000 a year.